"I like to keep my work ambiguous and open to interpretation. Memory is a large part of the process, and I wish to tap into the imagery of the subconscious. " 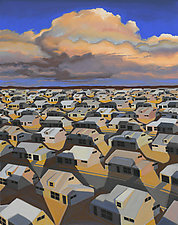 This series, now in its eighth year, is based on the artist's personal experience growing up in Levittown in the '60s. 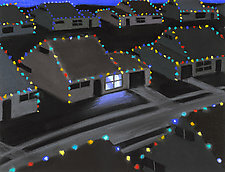 Initially triggered by a dream of swimming in pools at night, these pastels have become an interpretation of how we live in the suburbs, and an attempt to find beauty in what we consider ugly. Wommack starts his original pastels in charcoal pencil, creating scenes entirely from his head without the use of photographs or computer tools. He does this to keep a playful and unexpected quality to the compositions. For his giclee prints, he uses an eight-color archival pigmented ink Epson system, printing on acid-free Ultra Smooth Fine Art Paper. R. Michael Wommack received a BFA from Tyler School of Art in Philadelphia, after attending the first session of the Pennsylvania Governor's School for the Arts. 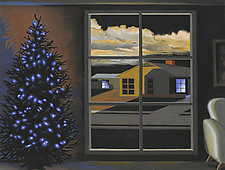 He collaborated with architect Robert Venturi from 1984 to 2009, all the while maintaining his own studio working in oil on canvas and various etching techniques.